ECY is committed to spreading the benefits of yoga within our community. Having established a diverse portfolio of outreach classes since 2015, over the last two years we have started to document the scope, scale and value of what we do. 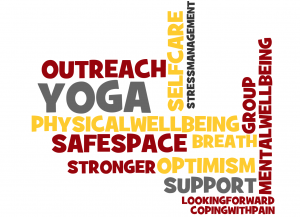 Last year’s annual report drew heavily on qualitative reflections from participants and teachers on the value of the classes we offer (this report is available on request by emailing info@edinburghcommunityyoga.co.uk). GENDER: 47% of those attending identify as male– a much higher proportion than is likely to be found in most mainstream yoga studios. KEY THEMES: Broad themes from analysis of our programme evaluations across all outreach programmes and classes. These themes are elaborated below using participant’s own words wherever possible. Before learning about grounding the person had just dug their nails into their skin to bring them back to the present moment. ‘The relaxation part is great, I always leave feeling relaxed and calmer not a regular feeling for me. Almost all groups commented on their mood being lifted. The following quotations are typical; sometimes it is hard to tell which comments are from health professionals and which from those they could be caring for – arguably a poignant comment in itself on the state of the NHS. ‘Knowing it is OK to feel how I do; lots of people need help to deal with stress’. Another participant noted the small but valuable step of recognising that stress is a problem: small steps, such as realising that it is okay to leave work on time, were appreciated. One woman who would be ‘a bit more OK with attending a class with men’ when previously she would have been intimidated by that. One participant said that preconceived ideas of yoga, based on flashy TV images of ‘almost double jointed people competing to bend the furthest’ had been‘blasted out of the water’. Many participants commented on the value of feeling supported without the pressure to perform, and without being judged. This seems to be a significant contributor to healing. ‘We’re don’t criticise anyone, everyone’s accepted …..Having a laugh when you are here, it’s funny when we don’t get something quite right, but everyone can have a laugh about it too. Feeling stronger, Sense of Achievement. Being in a safe space was mentioned by participants from three different groups. The way one put it, ‘A safe place, my time, our time!’ captures the sense of safety but also the link between individual and collective well-being. ‘not a class, a group – if I was in a class I would have panicked – in the group it is supportive, you know you’re ok’. ECY’s report to NHS Lothian – which drew on feedback questionnaires filled out by participants on the different courses provided. The quality of this feedback lies in its diverse sources: when analysed as a body it presents a very consistent set of themes that shed light on the value of ECY’s work. The kinds of benefits that participants note are very similar – whether the comments are from veterans, people in recovery, victims of trauma, or the health care professionals that are suffering from stress in trying to meet the diverse demands of the NHS. The next stage of developing evaluation depends on more robust and consistent means of data collection and analysis across our projects We are actively seeking research collaborators and hope to be able to develop high quality evidence in support of our work. We also hope to be able to provide impact reports for specific groups that in future, may contribute to evidence based practice.